Love to bake? On a special diet? Just in time for Mother's Day, Bake Deliciously! Gluten and Dairy Free shows how to make over 150 beautiful baked items without gluten, dairy and other common allergens. Jean Duane, Alternative Cook, shows her mastery of baking in this a must-have cookbook for anyone following a special diet. She shows how to make appetizing cakes, muffins, quick breads, truffles, cookies, soufflés, crackers, desserts, snacks, breakfast treats, tarts, pies and crisps. Bake Deliciously! has over 150 mouth-watering easy-to-follow recipes completed in five or less steps. The cookbook with beautiful color photos will be welcomed by those with Celiac Disease, gluten intolerance, dairy allergies or intolerance, Autism, ADD, ADHD, Crohn's Disease, IBS or Aspergers. It contains a lot of useful reference information for the newly diagnosed, as well as for diet veterans. Kelly Gilpin, Editorial Director for Future Horizons, a world leader in books, DVDs and conference on Autism says "Bake Deliciously! Gluten and Dairy Free Cookbook will make you reevaluate what you thought you knew about GFCF diets! Jean Duane's innovative ideas, paired with taste-bud tingling images, will inspire you to set off on a culinary journey that your whole family can take part in. From cheesecake to cheese crackers, apple pie to pizza, this cookbook transforms dietary limits into options, options, options!" So many gluten-free cookbooks feature flour mixes that contain 60-75% highly refined starches such as tapioca flour, cornstarch, sweet rice flour and potato starch. Jean Duane, Alternative Cook focuses on using a higher percentage of gluten-free whole grains such as sorghum flour and brown rice flour. She shows many innovative substitutions for dairy products and other allergens. After two years of developing and triple-testing recipes, the results are just spectacular! These baked items rival those made with traditional ingredients. And she makes it easy with time and money-saving tips like pre-packaging your own mixes. 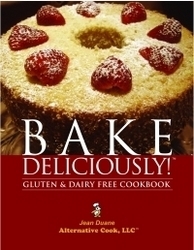 Cynthia Kupper, RD, Executive Director, Gluten Intolerance Group of North America says: "Bake Deliciously! Gluten and Dairy Free Bake Deliciously! is a great source of recipes using healthier ingredients and methods to also make them nutritious - lower in cholesterol and encourages the use of healthier GF grains. I love that all the recipes are easily made using very few steps. This is a great book for anyone new to gluten-free, dairy-free baking." The cookbook shows ingredient comparisons - photos and notes on what happens in a recipe when one ingredient is changed. For example, what happens when you use xylitol (a sweetener used by diabetics) versus sugar; tapioca flour versus Expandex™ (a tapioca flour derivative); sugar versus stevia and more. It even contains a recipe for margarine. Says Jean Duane, "Since so many butter-substitutes contain casein, a protein found in dairy products, I was determine to develop a butter substitute that did not contain saturated fats or dairy products". Karen Simmons, Founder & CEO of Autism Today says: "Once again, Jean Duane makes cooking for our kids and adults on the Autism spectrum simple, easy and tasty too! With step-by-step instructions, baking gluten-free and dairy-free (GFCF) has never been this fun. If you're looking for a passionate and delicious way to connect with those you love, this is a MUST READ!" Gluten-free pioneer and cookbook author, Carol Fenster, PhD. says: "If you're looking for delicious GFCF baked goods that will 'fool' even the most discriminating palate, this book is for you. Go get a copy and start baking!" Jean Duane, Alternative Cook loves cooking deliciously, even when food allergies or health conditions require cooking "without". She maintains a gluten-free, dairy-free, low cholesterol diet, and has been developing recipes for 20 years. Her passion for cooking, combined with her professional training has enabled her to create a series of full-length cooking DVDs, video streams and the Bake Deliciously! Gluten and Dairy Free cookbook. Ms. Duane is a prolific writer and national presenter on alternative cooking and baking. She appears on multiple TV segments on Comcast Video On Demand and PBS's Life Wise series.